Lawmakers are once again working to end a surcharge program they say is ineffective and unfair. But the program also provides millions of dollars to trauma centers across Texas. 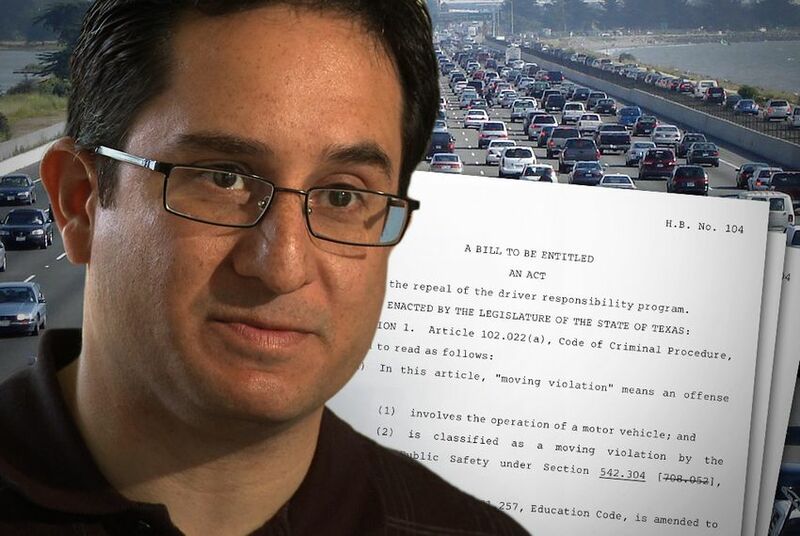 A bill filed Monday by state Rep. Larry Gonzales, R-Round Rock, seeks to repeal the controversial Driver Responsibility Program, which penalizes drivers convicted of certain traffic offenses with annual surcharges. The Driver Responsibility Fund was established to discourage unsafe driving and to raise revenue for the state. Under the program, each conviction for a moving violation means points on a driver's record. Once a driver reaches six points, the program assesses an annual surcharges for license renewal, starting at $100 and increasing $25 for each additional point. Surcharges must be paid every year a driver has six or more points on his or her record. Some first-time convictions, including DWI, driving without insurance or driving with an invalid license, automatically result in surcharges. Fees for those violations can be up to $1,000 and must be paid for three years. The charges come in addition to fines and court fees already associated with each offense. If the surcharges aren't paid, driver's licenses are suspended. Gonzales was unavailable for comment about the latest bill seeking the program's repeal. Critics of the program, including lawmakers who have tried to repeal it in the past, say it hasn't worked. They point to the more than 1 million Texas drivers whose licenses have been suspended because of the program. DPS spokesman Tom Vinger said the agency is not aware of studies showing the effectiveness of the program in reducing reckless driving. Some critics, including outgoing state Rep. Leo Berman, R-Tyler, and state Rep. Lon Burnam, D-Fort Worth, who attempted to repeal the program in 2011, also say the program makes drivers pay twice for the same offense and amounts to double jeopardy. A representative from Burnam's office said he would be working to repeal the program again this session. But Welsh said the program is justified. "Drivers who are habitually reckless pay into the program," she said. "It's not for people who got one ticket. We've always thought that was a good connection — that reckless drivers help pay for the trauma system." Welsh said that one in four trauma cases in Texas is related to a car accident. Lawmakers have attempted to adjust the program, offering fee reduction and temporary amnesty programs. The latest of these efforts is an indigency program started last year that allows low-income drivers to pay 10 percent of the original surcharge owed. The program caps the amount such drivers would have to pay at $250. Those seeking to eliminate the program say the adjustments don't solve its problems. However, trauma care advocates say that if the program is ended, something must be done to replace the funding it provides. Trauma centers provided $227 million in uncompensated care to patients unable to pay in 2011 alone, Welsh said. "If general revenue funds were coming to us, we'd be fine with that," Welsh said. "But money doesn't seem to be growing on trees these days." Editor's Note: This story has been updated to reflect a more detailed statement from the Texas Department of Public Safety that was provided after the initial publication .